Perhaps the ultimate highlight of the drive from Aoshima to Cape Toi in southern Miyazaki, Kyushu is the drive itself. Routes 220 and 448, for the most part, stick to the coastline giving drivers and passengers an eye-full of nature's drama, a collision between land and sea where rugged and precipitous cliffs, headlands, and islands battle Pacific Ocean waves. In between this struggle the quiet towns and villages of Nichinan and Kushima work whatever flat bits of land there are, while beaches (and waves) pass by with barely a soul stopping to enjoy them. While the way behind the wheel is mostly easy going (the pace in these parts is languid, the roads lined with palms, and the traffic fairly minimal), some sections of the drive, particularly on the approach to Cape Toi, can reach elevations where the distance between safety and, well, a tumble to your death, might be a little too close for comfort, for some. What follows is a list of sightseeing spots between Aoshima and Cape Toi that we stopped off at on our drive. They are listed in order of north to south. I make no claim of these being the best places to visit or the most off-the-beaten-path spots in Miyazaki. They are simply the places that we saw and sampled. The drive actually took place over two days. Taking in all of these spots in one day would probably be impossible, and even if it is, it would be too busy to recommend. The drive from Aoshima to Cape Toi, without stopping for any great length of time, would take around two hours. Horikiri Pass About 2 km south of Aoshima a road forks left off Route 220. As it bends before plunging into the ocean you come to Horikiri Pass clinging a lofty 60 m above the deep blue. Just as you enter the pass there’s a small parking lot for a bit of a viewpoint. Stop if you will, but there are far better views to be had at ... Roadside Station “Phoenix” This former drive-in, now turned road stop is something of a sightseeing staple in these parts. As well it might be. The views from the observation decks across the road are stunning as you gawp at a dramatic coastline of verdant green tumbling into a primordial display of rock and ocean. The road station itself serves the usual road station tack and souvenirs and it has an unappealing restaurant on the 2nd floor. The 3rd floor has an interesting display of black-and-white photos portraying the station in the days when visitors wore heavy suits and dresses on their beach holidays. Come for the gob-smacking views and the toilets. Udo Shrine One of the main tourist draws along this stretch of coast is the cave shrine of Udo-jinja (Udo San). This is some spectacular real estate -- a patch of land seemingly chiselled out of craggy rocks battered into painful formations by millions of years of relentless winds and ocean force -- home to the equally spectacularly named chief deity, Hikonagisatake Ugayafukiaezu-no-Mikoto. After the parking lot there is a small area of souvenir shops, cafes, and toilets. Beyond this, enter the grounds of Udo Shrine proper through the large gate and follow a gravel walkway, with views to the ocean, as it takes you over a quaint bridge and down some precipitous stone steps to the main shrine building. It’s dark and dank around the “sanctuary” of Udo Shrine but it lends a haunting romance to visits as beams of light from outside expose parts of the vermillion structure. There are international crowds here though, many of whom congregate above “Turtle Rock,” into which they try to toss clay balls in a bid to make wishes come true. You have to pay for the balls, of course. Parking for Udo Shrine is going to be tricky if you’re a nervous driver, hesitant behind the wheel of a rental. It’s a tight parking lot and if you’re unlucky with the timing, you’ll have to wait on the road leading down to the site for spaces to become available. Parking attendants will let you know when a space opens. The cafe / souvenir area of Udo Shrine has a branch of Rainforest Cafe Shu Factory. It’s mostly standing room only but is your best bet in these parts for a nice coffee or ice cream. Despite the crowds and the fame, Udo Shrine is an eye-pleaser and well worth the visit as far as this traveler is concerned. Obi There are a number of towns across Japan that have been labelled “Little Kyoto,” Obi in the Nichinan district of Kyushu is one of them. Around 4 km inland from where Route 220 passses through the town of Aburatsu, tucked into a bend of the Sakatani River, Obi puts on a display of picturesque, historic streets lined with buildings that might look “Kyoto,” but are thankfully devoid of the Kyoto crowds. In fact, during our visit (the first Saturday of Obon no less) the town was very quiet. We started our explorations among the ruins of Obi Castle in the northern part of town. While not much remains of the castle structure, the walls are in place, the reconstruction of the Ote-mon gate is impressive, and some sections of the grounds are filled with beautiful, towering cedars. The small museum here displays collections from the Ito clan who ruled over Obi for nearly 300 years from the late 16th century (and were on one side of the longest war in Japan’s history, lasting 84 years with the Shimadzu clan). The museum collection includes weapons and armour, maps, and clothes, among other items. For a museum of this size, this far away from any center of international tourism, it was pleasing to see the English-language explanation. Just south of the Ote-mon gate is the charming Yosho Hall (Yoshokan), home to former Ito clan leaders. While it’s not possible to enter the building itself (you can peer in from outside), the grounds are pleasant and have a slightly neglected charm that makes for a nice contrast to the painfully preened traditional Japanese gardens you might be used to. One block north of Obi’s main thoroughfare, Route 222, on the quiet Ushiromachi Road you can see an example of the old water channels that were used to bring water from the Sakatani River to people's’ homes. While such engineering is almost redundant these days, a section of channel at the western end of Ushiromachi is now home to a shoal of brightly colored carp. Route 222 is a wide street lined with buildings in keeping with the spirit of this “Little Tokyo.” Despite being the main artery pumping traffic through Obi, it’s almost as quiet as the rest of town and most of the eateries we spotted were either closed or empty of customers. There’s a sizeable (and free) parking lot on the approach to the castle grounds, just south of the Yosho Hall, where you’ll find a visitors center / counter and perhaps the busiest restaurant in town serving Japanese staples. “Passes” are available gaining entry into each of Obi’s main historical sites. The cost is 600 yen, or you can pay the 200-yen entrance individually. The passes cover seven sites. You do the math! Nango Roadside Station As roadside stations go, we’d say that Nango is a bit of a belter. In the summer at least, Nango Roadside Station could be in tropical Southeast Asia. On Route 448, just south of the small port town of the same name, the “station” is surrounded by bright flowers and lush greens which climb their way up into the hills above and onto a vast complex of gardens, cultivated areas (home to the Yuyo Botanical Gardens) and forest. Look the other way and here the ocean is a brilliant turquoise dotted with rugged islands large and small. It makes for a fine place to take a break from the driving and kick back with an ice cream from the small cafe / restaurant here. A roadside station maybe, but sitting in a beautiful part of the world. *Note - From Nango Roadside Station the plan was to stay on Route 448 all the way to Cape Toi. However, signs at the station were telling us the next few kilometers of 448 were undergoing roadworks to strengthen the area against landslides. Or to clear up a landslide. We couldn’t be sure. Instead we had to backtrack to Route 439, loop around on that, and then rejoin 448 somewhere around the town of Ichiki. Route 439 looks fine on Google Maps but is actually very narrow, going to single-lane as it snakes up and over the forested hills. It can be tricky stuff if you meet traffic coming the other way and will test your skills at driving in reverse, on steep inclines, and around blind corners. Cape Toi Route 36 pulls off of 448 leading the way into the cape and southernmost Miyazaki Prefecture. At a small gatehouse, pay the 400 yen entrance fee to get into the cape. Where Nango could pass for rural Southeast Asia, Cape Toi, and in particular its crest at Toimisaki Point, could almost be mistaken for the poet William Blake’s “green and pleasant land” as he famously described England. This is a landscape of rolling hills covered in a thick carpet of life-affirming grasses, decorated with flowers, exposed to vigorous winds, affording of refreshing ocean views, and finished off with … horse poo. Yes, one of the main attractions of Cape Toi, along with the stunning views, is the Misaki Horses that move around the cape, eating and pooing, pooing and eating. They’re “wild” -- using the inverted commas to highlight that each of them has a number (branded / shaved into their rump), they probably get better healthcare (certainly cheaper) than you or I, and they don’t seem to endure the kind of brutal natural order of things that you often see on documentaries narrated by David Attenborough. At one point Cape Toi’s horses even put up a roadblock in front of the rental. I was behind the wheel at the time and wasn’t quite sure what to do. One of the hooved “squad” stuck its mug into the windscreen, presumably to eye-up the potential for food. It was all entertaining stuff but with a traffic jam forming behind us I eventually nudged the accelerator and inched us through the crowd. (Sup?! - Up close with the wild horses of Cape Toi, Miyazaki) You need a car for Cape Toi. There are a number of “attractions” here spread across a fairly wide area. These include a visitors center in which you can be educated about the area’s horses, while the Toi Misaki Lighthouse has the kind of views you’d expect from a lighthouse -- exposed and spectacular. My favorite spot was Misaki Shrine, a tiny point of reverence clinging to cliffs aboce the ocean. 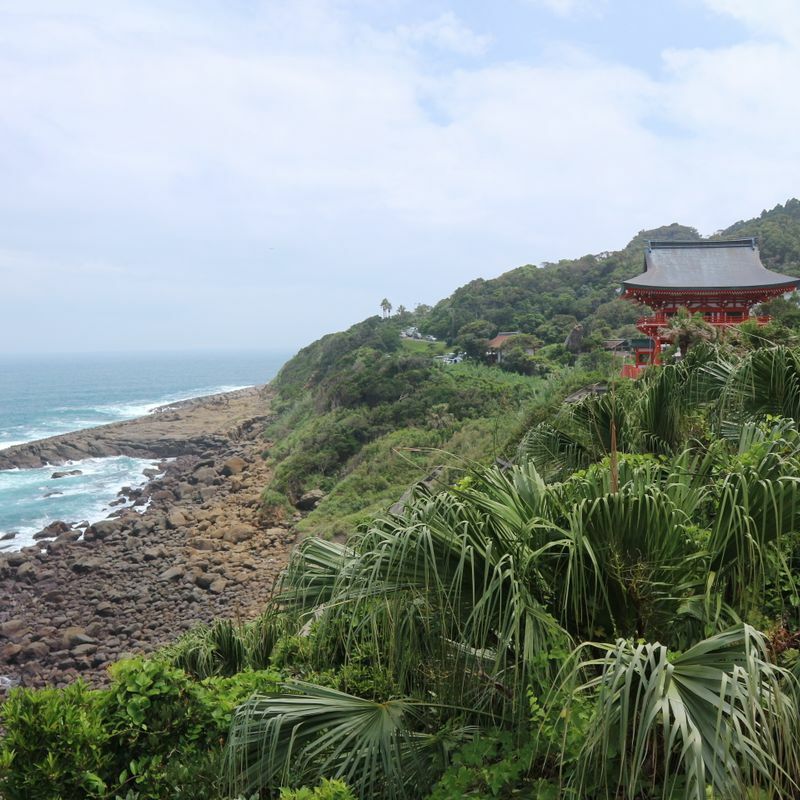 You can’t go up to the shrine itself, viewing it instead from a beautiful spot of palms and quiet by a stream that wanders down into the ocean. You stand a good chance of having this place to yourself for a short while and it really is pleasure. If the horses aren’t loitering by the quiet road that navigates the cape, you can find them up on the hillsides above. There are places to pullover / park up allowing you to climb the slopes and hang out with the horses. Cape Toi literature is at pains to tell you not to touch them, although they don’t seem to be bothered by human presence as they go about their business of eating and pooing. One of the highlights of the Miyazaki trip. Trip notes (Trips notes -- Aoshima to Cape Toi -- from yours truly) With a full(ish) tank of gas, there will be no need to stop for a top up at any point on your drives between Aoshima and Cape Toi. There are enough opportunities for a toilet stop with the combination of road stations and convenience stores. That said, if you’re coming from the city, convenience stores will seem few and far between. While sightseeing spots come with the staple cafes and restaurants, to be honest, you’re not spoiled for choice in these parts. If you want a unique eating experience, you’d really better do the research first. Otherwise, stock up on breakfast at your accommodation and make do with convenience store breads and roadside ice creams. It can sometimes be difficult to spot signs regarding the speed limit in these parts. As such we just settled into the speed of whoever was in front of us. There was little, if any, police presence, and I don’t recall seeing speed cameras. The nature of the terrain and the spectacular scenery should dictate a sensible speed anyway. Even on the longest run from Aoshima to Cape Toi, with all the spots we stopped at that day, we were still back in Aoshima before dark. Something of a relief really, as driving these roads after sundown is probably not much fun. There are no highways on this stretch of coast, so no need to worry about having an ETC card or change ready for toll booths. Of the spots listed above, only Cape Toi required an “overall” entrance fee.